Project Eternity - The Game That Almost Wasn’t - An Interview with Adam Brennecke | Boards o' Magick - The Stuff of Legends, Right Boo? Discussion in 'Pillars of Eternity' started by Marceror, Oct 20, 2012. Click here to see this beautiful screenshot in high resolution. This sure ain't your dad's 2D isometric game! Note: the interview with Adam was very casual and very conversational. For this reason many of the questions and responses have been edited to ensure a focused read. [Marceror] The Kickstarter campaign wrapped up this week. Every single stretch goal was met – including the $4m stretch goal that was announced mere hours before the campaign wrapped up! First, a big congratulations. [Adam] Thanks! We had no idea this was going to happen. We thought maybe we could hit $3.5m, maybe. I woke up on Tuesday morning (10/16/2012, the final day of the Kickstarter campaign) and saw that we hit $3.5 million, and I was like holy crap, we better put up a new stretch goal! [Marceror] With all the content that you’ve committed to including in the game, is April 2014 still looking like a feasible release date? [Adam] Yeah. In the beginning it may have seemed like we were a bit caught off guard by how quickly things were happening, but we did have a plan for the stretch goals ahead of time. The development team will be ramping up in size to tackle the increased scope of the game. [Marceror] How far along are you with the planning process – has actual development truly started yet? What's next on the schedule? [Adam] It’s preproduction. On the design side we are nailing down the major characters, the story, the lore, monsters, etc. On the programming side we are working to make a functional game system. Everything has to be ready once we hit production so that designers can start creating actual content. [Marceror] We were very spoiled during Kickstarter with the daily information updates. Do you have a sense as to how regularly progress updates will be given to the community going forward? It’s great that you have so much freedom to interact and share with the fans, but I’m sure there’s a point where too much sharing might detract from productivity. How will you find the right balance? [Adam] We’d like to do updates as often as possible. We are still working this out, but I’d at least like to provide updates to the fans on a weekly basis, perhaps bi-weekly. We love the freedom that we have with this project to share with the fans and get their feedback. I’m looking a lot at how Double Fine Adventure (another recently successful Kickstarter project) is handling this. I like their format and will probably do something similar. In fact, Josh (Sawyer) is currently working on an update that will be shared soon. We want to continue to keep in touch with the fans, and let them know what’s going on. We actually enjoy it. [Marceror] I imagine that when you put something out there for the fans to see, you get immediate reactions and feedback, and it helps you to go back and know better how to iterate on your ideas. [Adam] Definitely. Usually you don’t get a chance to communicate with our fans like this. They are the ones who are playing our games, and we like see their feedback early in the process. [Marceror] The Endless Paths of Od Nua reached 15 levels. Crazy! Is that a lot more than Obsidian was originally expecting? [Marceror] I know Obsidian is filled with many brilliant, creative minds, but 15 levels! Are there any concerns as to whether you’ll be able to make such a massive dungeon engaging and interesting from start to finish? How do you plan to accomplish that? [Adam] It’s going to be a challenge. With anything it’s going to be a challenge. You know, everything in game development is a challenge. We’ve been talking about how we want to tackle it and we have a pretty good plan about how we want to design the dungeon. [Marceror] It’s probably not anything you can talk about right now can you? [Adam] No. It’s really in the early stages of design. But we have a pretty good idea of how we want to do it. It should be fun for everyone. I think all the fans will like it. [Marceror] Is there an ETA on when approximately you'll be sending out the item templates for the $1000 tier donors? How much info are we going to get alongside, since it's hard to design any item without the knowledge of the game mechanics? [Adam] It will probably be around the time when we really get a good basis for the rules system. Before then it will be hard to know exactly what sorts of features these items will be able to have. So it’s going to be at least several months. We’ll let everyone know when we’re getting closer to that point. [Marceror] Where'd the Ouroboros roll off to? [Marceror] Given the huge success of the Project Eternity Kickstarter campaign, do you even see yourselves going with the traditional publisher model again from this point onwards? If so, why? [Adam] Oh yeah. We’re going to continue to use that model. For one, we’re a pretty large company. We need those large projects. It’s something – we’re built to do those large projects. [Project Eternity] is something that we all wanted to do. We’re probably not going to get another chance to do something like this. The stars aligned. Josh and I weren’t working on another project, and we started talking about what we wanted to do. We had been talking about [doing a game like Project Eternity] for a while, but the opening was never there. But we had the time back in July and August , and we said, let’s just do this. [Marceror] I expect that if this IP is as popular as it looks like it’s going to be, you’ll want to keep it going, and develop additional games in this universe. [Marceror] Will those games likely use the Kickstarter model for funding? [Adam] It really depends on how popular the product ends up being. We really want this game to be a big success. If it’s popular enough we won’t need to use Kickstarter to fund the sequels. [Marceror] Might you try to go back to the traditional publisher funding model, if you can prove that this game style has the profit potential to lure a big publisher into supporting it? [Adam] More likely we’ll try to self-publish it, using the profits that we make from selling Project Eternity. If it’s that successful we can make enough money to fund the next title. That’s kind of what we’re planning on doing for the expansion. We’d prefer to self-fund rather than go through the Kickstarter. I think fans enjoy doing it, but it’s a risk to them since they don’t know if the game is going to get made or not. It’s also a lot of work on our end to manage a Kickstarter campaign. So we’d rather be able to self-fund our projects. [Marceror] It will be great to see this IP become self-sufficient. [Adam] Yeah, it’s nice that we’re building the technology now for this new engine – we’re using [the Unity engine], but we’re also building a lot of our own stuff, to make this type of game work on Unity. So we’ll have the framework and the technology, so who knows where it can go. [Marceror] In other words, the next game should be a lot easier to develop. [Adam] Yes. The next game will be easier to develop. Plus we may be able to develop different stories, different worlds, who knows. You know, how Bioware did the Infinity Engine. They were able to tell a lot of different stories with it. [Marceror] It would be awesome if this engine became the catalyst for a whole new set of CRPGs that are built using the 2D isometric model. [Adam] That’s what we’re hoping for. We really want to see where we can take this. [Marceror] Pathfinding... the bane of Infinity Engine games. How are you going to make it (infinitely) better in Project Eternity? At this point Adam walked me across the hall to see a cut out of an apparent superhero that is posted in the window of one of the developer’s offices: The Pathfinder. 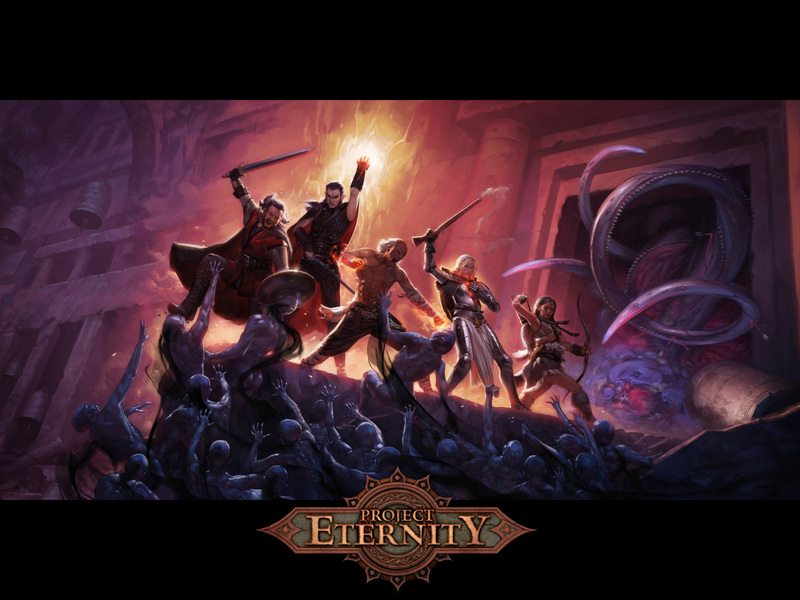 It seems that The Pathfinder is an inspiration to the developers of Project Eternity to create a game where characters are smart enough to get where they’re going! Conclusion: the guys at Obsidian truly live and breathe this stuff. [Adam] Unity’s pathfinding is a lot better [than that of the Infinity Engine]. We’ve come a long way since 1998 in terms of computational power on computers. Doing faster and better pathfinding is something that we’re looking forward to. Right now we’re experimenting with what feels right. We’re figuring out how characters can interact with each other. If one character is blocking another’s way, can they push each other out of the way, do they side step, can they share the same space? Does it feel right if they do that? That’s the kind of experimenting that we’re working on right now. [Marceror] Are you going for a more open feel to the game (ala Baldur’s Gate 1) or will it be more like Baldur’s Gate 2, where you basically couldn't turn around without bumping into a quest of some sort? [Adam] We were just talking about this on Wednesday. 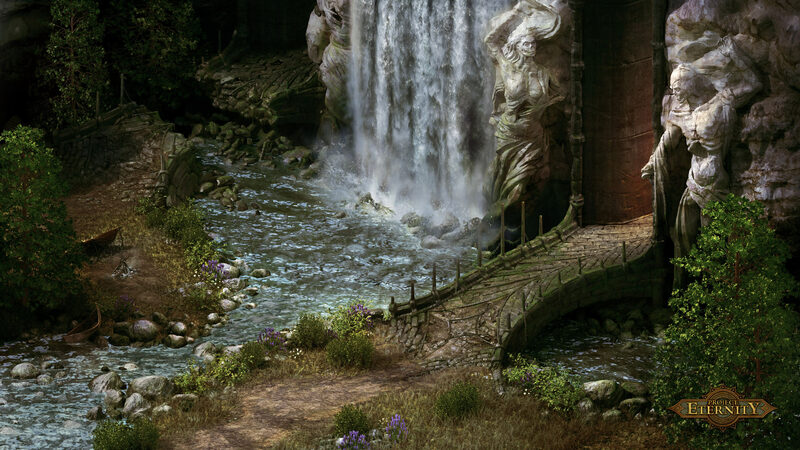 We definitely want to have wilderness areas like in Baldur’s Gate 1. We want to encourage exploration, but it’s definitely not going to be as aimless as it was in Baldur’s Gate 1, or as tedious. We want to make fewer areas, but have more content in them, and make them a bit more focused. [Marceror] Do you plan to continue your Icewind Dale 2 adventure? If so, will you be doing so with the world watching again, or have you decided against that? [Adam] I’m definitely going to keep it going. I really want to go back and play the game. [Marceror] Was it stressful trying to create your party from scratch with thousands of people watching, when you were clearly pretty rusty with the DnD 3.0 rules. [Adam] It wasn’t really stressful, but it reminded me of how much I’ve forgotten. I’ve played more 3.5 than 3.0, and most recently I’ve been playing Pathfinder, which is quite a bit different than 3.0. Party creation in Icewind Dale 2 is kind of out of control. [Marceror] You really have to know your stuff. Or you can use the pre-generated parties. [Adam] Not only do you need to know your stuff. You really need to be familiar with every class. I like how in Neverwinter Nights 2 you had a recommend button. So if you’re looking at the feat list and you’re like I have no idea… let’s see what the designers recommend. [Marceror] I know this is early, but do you think we’ll need a recommend button in Project Eternity? [Adam] I don’t know. We’ll see how it turns out. We’re thinking that since we’re not using DnD we’re going to have to explain our rules a lot more clearly. So if you’re presented with a list of like 100 feats right off the bat, you won’t be overwhelmed. [Marceror] Will there be that same level of depth, where there are a massive number of feats and other options available for a player to choose from? [Marceror] That’s great. I’m the sort of person who doesn’t mind getting a little overwhelmed at first. I’ll take the time to try and figure everything out. I’ll probably screw it up on the first play through, but that’s an excuse to go back and do it better the next time. [Adam] Yeah, and that’s where I think having a recommend button is really going to be helpful. So the newbie knows where to go. They get their selection, but the guy who knows what they’re doing can go in and control his options more closely. [Marceror] Inquiring minds want to know. Who was the most hung-over Obsidian employee following the celebration on Tuesday night? [Adam] Probably Rob [Nessler, the Art Director for Project Eternity]. He by far was working really hard during the entire campaign, generating new art, keeping the progress images up to date and generating all of the dungeon levels. He really wanted to make each level unique, and make sure he wasn’t copying a level from above. He really wanted to hand draw it. [Marceror] I can see that. There’s a lot of little details that are included in that picture. It’s clear that it was lovingly crafted. [Marceror] Is there any cool detail about the game, perhaps something about a companion, a class or race, a story element or some other detail that you might be able to share with me, to be shared as an exclusive first at Sorcerer’s Place? Obviously something that you won’t get in trouble for sharing. …Adam thinks solemnly for a moment…. [Adam] We are developing a character that is an Orlan Cipher, who is a detective (Orlans are a new race in Project Eternity. They are small folk based after the gnome and the Halfling). He isn’t necessarily upper class, but he comes from wealth, so he dresses very nicely. Because he’s a Cipher he has somewhat psychic abilities that help him as a detective, and he uses that to investigate murders and the like. So that’s a character we are developing right now. [Marceror] So Orlans are the little guys, and Aumaua are the big guys. Would they be more analogous to, say, a half-orc? [Adam] Yeah, that’s good. Those are kind of the roles they were developed to fill. We don’t want to show them until they’re ready to go. We’re still developing the look of each race. [Adam] Several of the classes function differently than they did in DnD. The Paladin is a little different. They function more like the Warlord class from DnD. The Priest is a little more like a traditional paladin. They like to use firearms, which are good weapons to use against wizards. We want to keep a lot of things familiar for fans, but we also want to twist them. That’s what we like to do here at Obsidian. Firearms are another twist that, while present in DnD, weren’t really used commonly. [Marceror] Well the twists sound intriguing, and I know that I speak for an awful lot of your fans when I say that April 2014 can’t get here quickly enough. I look forward to the upcoming updates and watching the ongoing progress of this project! Thank you for taking time out of your busy day to speak with me. [Adam] My pleasure. Thank you for coming by. Here are five of the characters that you will meet on your journey in Project Eternity (assuming they survive this encounter). Edair is on the left. Aloth is next to him. Then Forton and Cadegund. Sagani is on the right. It has not yet been confirmed which of these will be willing to join your party. Click here to see this amazing artwork in high resolution. Nykidemus, wanderon, Paracelsi and 7 others like this. Thanks, Marceror, that was a very interesting read. I can't help but wonder how many levels they had ready to go on that The Endless Paths of Od Nua picture as they keep adding them. Maybe they will release the whole image. Well, they started with 3, and I think Rob Nessler (the Art Director) had it ready up to 6, maybe 7. Those updates were quickly posted on the Kickstarter site when the requirements were met. After that Feargus mentioned in the Kickstarter comments section that he had Rob doing the artwork for up to 10 levels. The next 3 levels came so fast that an 11 level dungeon was never posted. It went straight to 12. 13 was seemingly ready as it didn't take too long to get that one posted. Feargus has mentioned a couple of times that Rob is working on the finalized 15 level artwork, but I get the impression that Rob needed a bit of a break from it. Incidentally, I met Rob when I when I was at the Obsidian offices last week. He struck me as a man who takes his tea very seriously. I got some feedback from Adam this morning that indicated he was really happy with how the interview came out. I'm going to see if I can turn these into a series with him, and do a few more before the game is released. So stay tuned on that.